I never met actor Dennis Weaver, but I sure wish I did. Not only was he anyone’s idea of an environmental hero, he also sounded like a whole lot of fun. The brief obituaries of this well-known actor, who died of cancer at age 81, stressed the part of his life taken up with Gunsmoke and, later, McCloud. They often included only a single line about his activism. "Off-screen, Weaver served as president of the Screen Actors Guild and was a vegetarian and activist for environmental and charitable causes," said one. Unlike the Hollywood "environmentalists" who sign a few petitions (and in the select company of a very few dedicated individuals like Ed Begley, Jr., Laurie David and Alexandra Paul), Weaver really lived the life. In 2001, for instance, he hopped on board a newly minted Toyota Prius hybrid car and drove it from Los Angeles to Denver, promoting alternative fuels all along the way. The event was so successful that it was repeated as the Drive to Survive in 2003, this time as a cross-country extravaganza from Los Angeles to Washington, DC, where it culminated in a huge alternative energy festival on the Capitol Mall. Weaver and crew later met with Energy Secretary Spencer Abraham. The vehicles criss-crossing the country included a truck running on grease from restaurant fryolators, an ethanol vehicle and a hydrogen-powered truck built by Tai Robinson (later famous for creating a hydrogen-burning Hummer). Sarah Zeff, who was the executive producer for both events, decries the fact that the media glossed over Weaver’s environmentalism. "Half of his life was devoted solely to the environment," she says. "Dennis was such a passionate person about leaving the earth in a better place for his grandchildren." Zeff spent three years working for Weaver, and she describes him as "charismatic and enveloping, with a kindness that was just deep in his soul. He had tunnel vision in some ways: He knew what the goal should be, and he didn’t listen to anyone who said it couldn’t be done. There’s a hollowness in the world now that he’s gone." Fellow actor Ed Begley, Jr., who worked closely with Weaver on many environmental issues, remembers him as uniquely dedicated. "Dennis was one of the most dedicated environmental activists that I have ever known," Begley said. "He was long a proponent of alternative fueled vehicles, before it was fashionable. He understood, more than anyone, that the environment and the economy needn’t be at cross purposes. It was that understanding that led him to start the Institute of Ecolonomics, an organization dedicated to finding ways to bring business and sustainability together, for the benefit of both." The cross-country drives grew out of the Institute of Ecolonomics, which, as the name implied, combines economics and ecology. "The whole thrust of the Institute of Ecolonomics is to create a sustainable source of energy that is clean and inexhaustible and economically feasible," Weaver said. According to the California Hydrogen Business Council, Weaver was a major advocate for fuel cells. 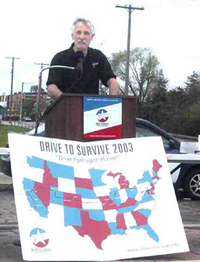 “He was an advocate for the environment and the hydrogen economy in particular," the group wrote, "a sponsor and supporter of the Hydrogen Drive to Survive in 2003, and a friend of many in the hydrogen and alternative energy community." A vegetarian since 1958, Weaver’s activism started with hunger relief. He co-founded, with other actors, the group L.I.F.E. (Love is Feeding Everyone) in 1981, and its work continues. Today, it supports agencies that collectively feed 150,000 hungry people in Los Angeles County. Using the "Earthship" design of New Mexico architect Michael Reynolds, Weaver built a home in Colorado using recycled aluminum cans (300,000 of them) and rubber tires (3,000 of them) as building materials. The house features large south-facing windows for a passive solar effect. The 10,000-square-foot Earthship also has large solar panels that supply almost all of its energy, resulting in a $50 monthly electric bill. It uses natural stone and tile floors, with roof and interior wood taken from "dead-standing spruce and beetle-killed blue pine." About the Earthship, Tonight Show host Jay Leno once quipped, "When the garbage man comes, how does he know where the garbage begins and the house ends?" Weaver, never one to miss an educational opportunity, responded: "If we get into the mindset of saving rather than wasting and utilizing other materials, we can save the Earth." growing up on a farm and growing my own food. I have seen the gradual destruction that mankind is doing to the earth which sustains us. The air, water and earth itself which supports life, our life, and that of the animals is being destroyed. Global warming, destruction of the ozone layer, too many people. Our earth is having a hard enough time supporting us all." His vegetarianism was also an outgrowth of his growing environmental awareness. "I became a vegetarian in 1958, which was very difficult in those days to really maintain because there weren’t many options," he said. "Now it’s a growing trend because the economics are there. There’s simply enough people demanding it that it’s profitable to supply vegetarians with those products." .The Union of Concerned Scientists (UCS) have warned us in no uncertain terms that we must change the way we relate to the Earth if we are to survive. If we do not, if we keep on destroying our life supports…our life-sustaining environment…the inevitable result will eventually be [in the words of the UCS] environmental suicide. .which happened as a consequence of concentrating on short-term gain with no understanding of what was necessary to attain long-term sustainability. History is full of many examples, but perhaps the model that demonstrates the problem most starkly is Easter Island. It was inhabited by the Polynesians around 800 A.D., and in the short span of eight centuries the population was reduced to cannibalism. .The inhabitants of Easter Island could probably have survived had the population remained at 800, when the first settlement was established. But that was not to be. Around 1600 the population had grown to nearly 30,000 and all the trees had been cut down. This was the beginning of the end." 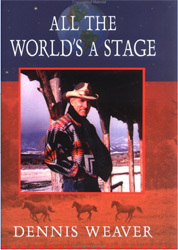 Weaver’s essay concludes with one of the great life lessons he taught, tirelessly, through more than 30 years of environmental activism: "We are all living on this one home called Earth, and for the good of all we must learn to share the great bounty that it has lovingly given us in a fair way, in a way that brings peace, productivity and prosperity to all."